Welcome to our MOUNTAIN GETAWAY! Even in the winter you can drive right up to the front door! This beautifully appointed home will make your getaway great. Cozy up with the woodstove and coffee in the morning or a movie in the evenings. There is plenty of comfortable seating and views to enjoy in the great room. The gourmet kitchen has all you need for those special meals. The dining table has extensions and can seat up to 8 easily. What a view to wash dishes by! The master bedroom is located on the lower level with a king bed and direct access to the deck. There is also a TV with Comcast cable in this bedroom. Long day skiing or hiking ? Hop into the master bath jacuzzi tub and rejuvenate! Or take a hot shower. The second bedroom, also downstairs, has a queen bed and also opens up to the deck. The bunkroom is adjacent to the bedrooms downstairs, has a twin bunk bed, a double futon, TV with Comcast cable and direct access also to the deck. The bunkroom also has an air hockey table. 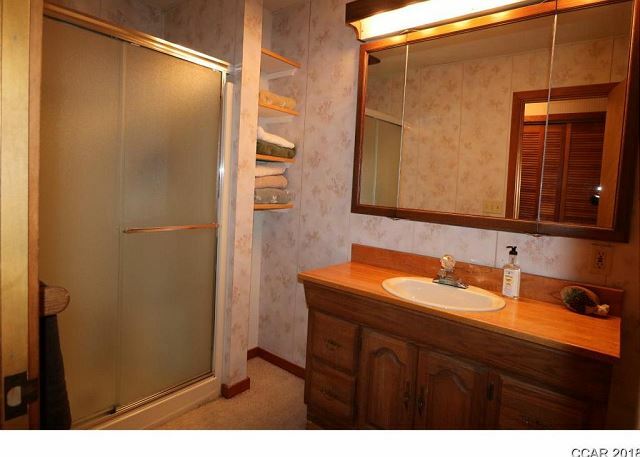 The second full bathroom is also downstairs with a shower. The rec room has a pool table, propane stove and plenty of comfortable seating. There is a BBQ and plenty of deck furniture for your summer relaxation. Enjoy coffee or a glass of wine and treetop views from inside and from the deck. 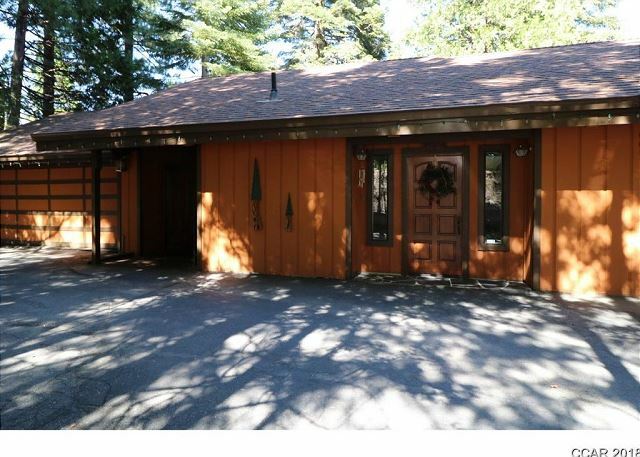 Cabin rental includes use of the Big Trees Rec Center during summer months (rec center guest pool use fees apply.) Guests will have the use of Big Trees Rec Center pools and facilities in summer. Guest fees apply for pool passes. Big Trees Rec Center is a wonderful place to relax in the shade and let the kids play. GORGEOUSLY appointed home on 2 levels. Central heat, woodstove, 2 bedroom + bunkroom, sleeps 7-8, pool table, FREE NETFLIX, LINENS PROVIDED. ALL CABINS HAVE A HOUSEKEEPING CHARGE and COUNTY TAX IN ADDITION TO THE RENT. 3 Night Minimum during holiday periods.This is the perfect cabin for both getting away and entertaining. Spacious living on 2 levels. Wood beams accent the extra large great room which features great wooded views from all windows, a wood stove on a rock hearth that extends to the ceiling. The home has a circular drive with almost level access to home and plenty of parking. The home also has central heat. 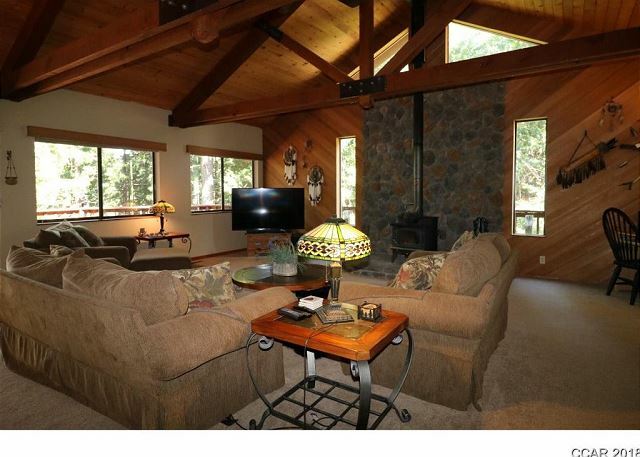 In the great room there is plenty of comfortable seating, a 55 inch TV with Comcast cable & a DVD player. FREE NETFLIX for guests. 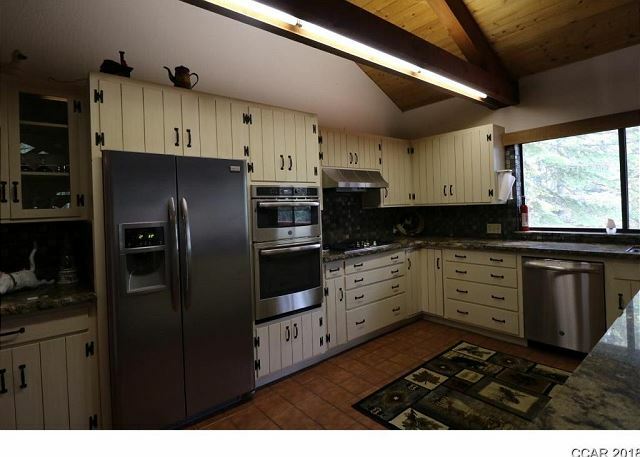 The kitchen has granite counters, electric stove and is well stocked with cooking items and plenty of counter space with barstools. The dining area includes a table with seating for 8. There is a wonderful open deck off the main living area with deck furniture and propane BBQ for guest use (summer only). 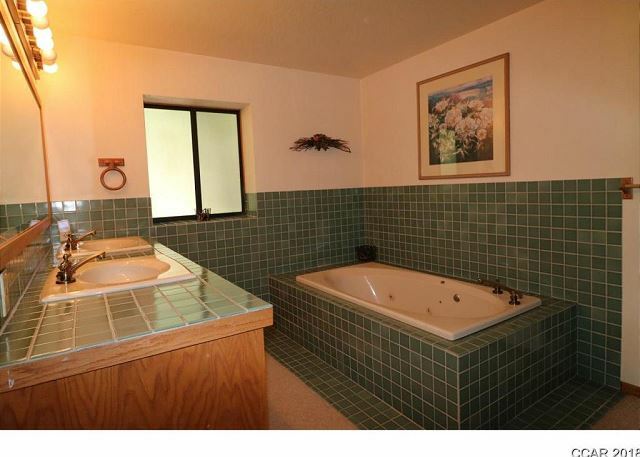 There is also a half bath on the main floor. All bedrooms are on the lower floor. The master bedroom has a king bed and a private master bath with a shower and jacuzzi tub. There is also a TV in the master bedroom w cable. The second bedroom has a queen bed. Downstairs there is also a dorm style area with a twin bunk bed and a double futon as well as another TV - 45 inch with cable. The downstairs rooms all open up to a covered deck. Just a short walk across the covered deck on the lower level is a rec room with a pool table and it's own propane stove heat. This room also has a stereo, games, puzzles and leather recliners for relaxation! 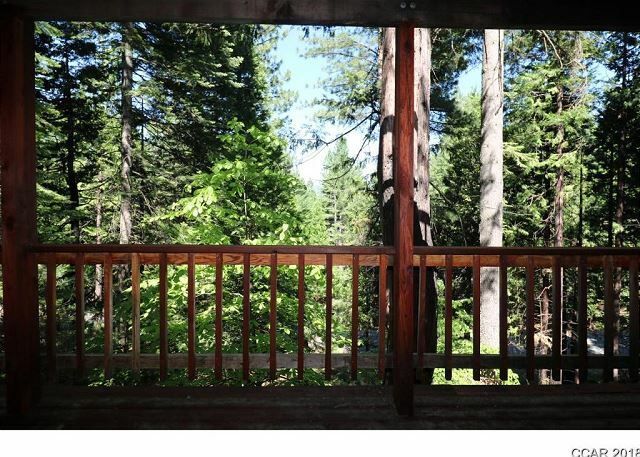 Home is one block from Calaveras Big Trees State Park access, providing hiking trails and majestic vistas. Washer/dryer, high speed internet. Big Trees Recreation Summer Membership (guest pool fees apply) Check out facilities & activities at http://bigtreesvillage.org/recreation-center/. No smoking, LINENS PROVIDED, WELL BEHAVED DOGS ALLOWED UPON APPROVAL, additional fee will apply.